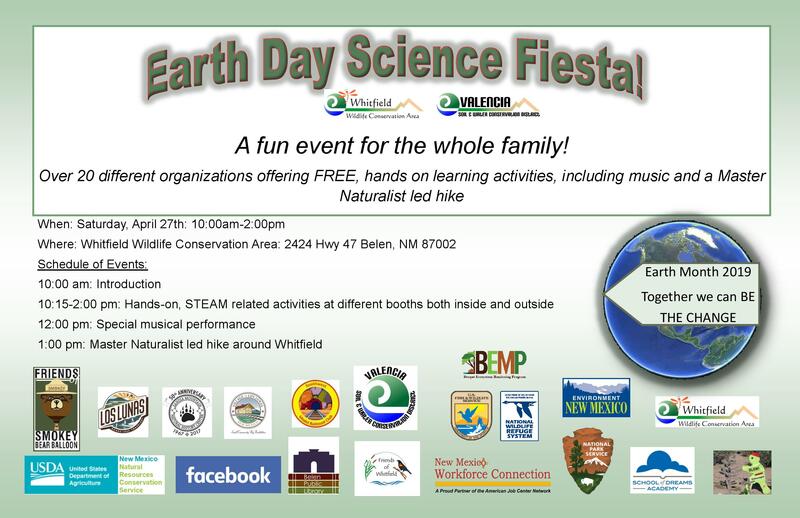 We are very excited to introduce the very first Valencia County Earth Day Science Fiesta coming up on April 27th. Come down to Whitfield to experience over 20 different participants from 5 different regions with free hands on learning for the whole family. This is a great opportunity to learn about The Rio Grande, internship opportunities, trains, the sun, renewable energy, multiple tourism sites in and around Valencia County, animal habitats, Prehistorical Native American technology, planting, growing and germinating your own seeds, how to make wind chimes out of household materials, wild fire prevention including a real fire truck and a 25 foot hot air balloon! While learning, don’t forget to also come and enjoy music, food, and a nature walk around Whitfield!